AIA Insurance announced the opening of its brand-new Head Office building, the AIA Tower, located at 92, Dharmapala Mawatha, Colombo 7. The move to the new building signals AIA’s deep commitment to further expand its growing business in Sri Lanka. The AIA Tower is a contemporary, 12-storey office building, which for the first time allows all of AIA Sri Lanka’s employees based in Colombo the opportunity to work together under one roof. 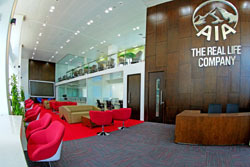 AIA Tower is also home to the AIA Sri Lanka Academy, a world-class training centre for Wealth Planners and Bancassurance Executives, which allows AIA to provide its people the highest standards of local and international training programmes.